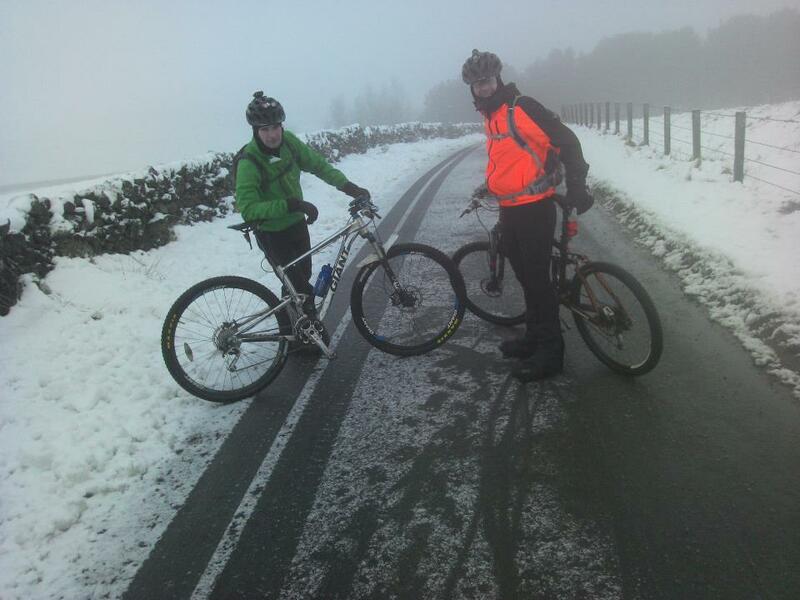 I reckon we were the first bikes up the track to West Kip since the snow fell. Made it to the foot of West Kip where we turned round and had a fantastic descent back down on the frozen snow. First day of British Summer Time so there was an hour less in bed but we still made it out by 6am and into freezing cold air. The temperature dropped to over -8c at one point but at least there was no wind. Conditions, apart from the low temperature and snow, were perfect in that the ground was rock hard , so no slogging up soft grass and even the snow where walkers had been was frozen solid making it relatively easy to ride on. We got right up to the foot of West Kip but the track round the side was non rideable so we came back down the way we'd come up and that turned out to be the highlight of the ride, fast and furious with loads of jumps over frozen snowdrifts. Out for 4 hours and over 29 miles done, what a way to celebrate Easter! The first steep ascent successfully completed! Still going strong it's beginning to get dark and the temperature's down to -5C! Dougie's son Marc, who's on his Easter school holidays, joined us on our Wednesday night ride with the intention (I thought) of going as far as he could then turning round and heading home. In the event he went right round the Winter Loop with us, never complained once, which is more than can be said of the rest of us sometimes, and succeeded in skimming over frozen snow a helluva lot easier than I did at times! I'm positive we could get him hooked on the mountain biking with a few more outings though his dad wasn't too impressed with me suggesting a dropper seatpost would be a great birthday/Christmas present. The beginning of a Pentlands glacier?!! Photographed this bit of track we usually cycle down yesterday afternoon, solid ice for about 100 yards. Clive aboard his new steed. And off he goes into a freezing Easterly wind! Clives new bike arrived eventually this week after several slightly threatening e-mails to the web site supplier and promises from them that everything would turn out OK. And so eventually it did, and when it was pulled shiny and very white from its huge cardboard box it was a nice looking bike! It's a Fuji Outlander 29r with high spec components and makes his bike shed even more overcrowded than it was before as his two little girls each got new bikes as well this week. Single handedly he's saving the bike industry from the worst effects of the recession! This morning the new bike made its debut up the Pentlands in bitterly cold weather and not a few icy patches of frozen snow as far as the Howe. On the journey back down from there we both suffered severe "brain freeze", it was so cold but the first ride was good and I look forward to a pedal on it when the risk of putting the first scratch on it by coming off on ice has receded! And into the bargain my new furry lined waterproof boots made their debut as well! The answer to my freezing cold, wet feet, hopefully, a pair of Northwave Artic fur lined mountain bike boots, photographed, rather unfortunately, on top of my garden waste bin!! A bit of Strava Challenge skulldudgery! Conditions this week have been pretty horrendous, a pair of fur lined cycling boots are a definite must for next winter! Cycling uphill through 4 inches of soft wet snow is a challenge in itself. The Giro's Train Like Taylor Challenge which is organised by Strava has taken up all my attention this past 2 weeks. I'm being accused of being obsessed by it and to be completely honest that's true! But then I'm in the top 30 in the world that's taking part, the top 5 registered in the UK taking part and actually number 1 worldwide in my age group!! So I think my OCD is at least partially excused in that I'm going to see the bloody thing through to the bitter end and see where I finish! The slightly devious bit is that , and I don't think I'll be alone in this, I'm not posting all my hours of riding until the challenge finishes tonight so that someone else can see my finished times and go out and beat me by a minute or two, I bet I'm not the only one! This snow's gonna derail my Strava Challenge! We stopped to watch an angler up to his waist in freezing water and wonder what the attraction in that was.....he was probably thinking the same about us. Baz, about to disappear into a blizzard at the top of Bavelaw. Baz and I went out about 12.30 for an afternoon ride in conditions that could only be described as atrocious, a biting easterly wind, below freezing temperature and the occasional blizzard. In other words a perfect day for a Pentlands bike ride, it makes it so much easier in the summer (what's that in Scotland) when you think back to conditions like this! We managed a very cold 26 miles then I went out at 6pm with Clive to add some more hours on to my Strava Challenge. It was even colder on this ride but at least the wind had died down a bit and the ground had frozen making some of the ride actually easier. About 53 miles ridden in total and I've moved into the top 100 worldwide out of over 12000 riders, there's still a week to go but heavy snow today that looks like lasting most of the week could scupper my chances of retaining that position! This Strava hour riding thingy is becoming an obsession! Clive has more comebacks than Frank Sinatra! Clive makes to the top of the Castlelaw Summit Grunt segment. Clive looks fresh, Baz looks knackered! Baz and me both claiming success at the top of the Grunt! The three of us looking remarkably fresh near the end of the ride. 6am and Clive was on the comeback trail yet again after a recent hernia operation, which he assured us was "major surgery", but this was immediately ridiculed,(we didn't want him to have an excuse for a poor showing today!). As it happened he acquitted himself very well considering he's not done a lot of biking for a good few weeks. Anyway there was no way he was getting it easy, that's not our way, if there's somebody struggling then they get punished no matter what the excuse! Right to the top of Castlelaw summit followed by the climb to the top of Allermuir meant that there was no hiding place. We were out for over 4 hours and covered just over 30 miles for a great morning's biking. Still staying dry....how much longer? 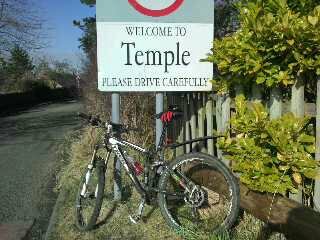 A 30 miler on side roads and off road today in great weather. 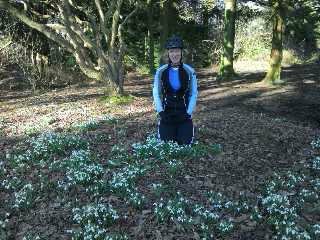 My co-conspirator in the great snowdrop nicking escapade. 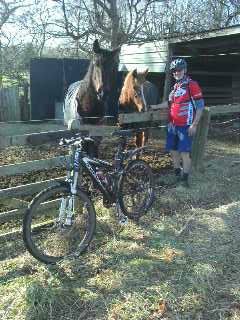 A pair of fine looking nags, and the horses are OK as well. Still no rain, c'mon this is Scotland, it supposed to rain every second day here! We're getting through the worst of the winter and even though the weather's been bloody cold at least it's been dry for the last week or two. I've been digging up snowdrops and transplanting them in my and a few other gardens. I know this isn't strictly what you're supposed to do but I look on it as being similar to keeping endangered animals in captivity to preserve the species. A pretty lame excuse but I'm sticking to it........and the garden looks quite nice as well!